Because the Maple Ash Neighborhood predates the era of tract housing, each house is distinct and unique. For the first standpipe art enhancement, we decided to take designs from the individualized windows and window decorations in the neighborhood and fill in the remaining design spaces with leaves to represent the lush trees in the area. Those trees are so large because of the flood irrigation system that provides deep watering. Irrigation is so integral to the neighborhood that I made a series of drawings that create a visual idea of the process. I had those tiles made into double-cut rubber stamps that we could press into wet clay to make tiles. We have used those tiles on every standpipe since. We have also added rock designs at the bottom of each standpipe that we call the “piddle pebbles.” A lot of dog walking happens in this neighborhood and we wanted to accommodate those furry friends. 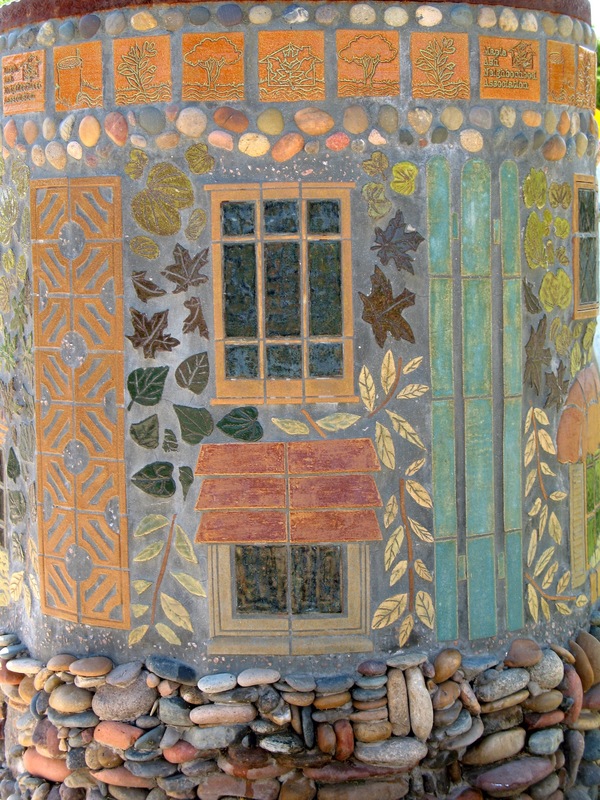 Neighbor Marty Miller applied river rocks at the bottom of the Windows standpipe in his own unique, interesting style. Another neighbor, Chris Rowley, created the iron work at the top. Unfortunately, half of the iron work recently had to be removed because of reconfiguration of the working mechanism inside the standpipe. The standpipes are working infrastructure for the irrigation system, so we know that maintenance issues can arise that may impact the art work. 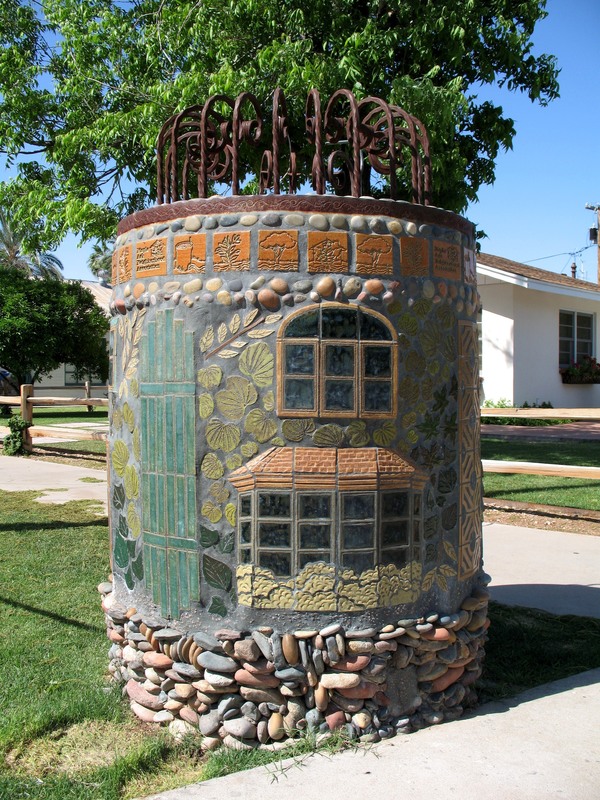 However, Salt River Project and the City of Tempe have been incredibly supportive of standpipe art, so we can’t complain. Other neighborhood volunteers helped with design decisions, made leaves for the design from slabs of clay, then helped glaze them. They also helped with installation and grouting. Many had never worked on a community art project before. They generally had a very good time.